Y'know, when I first played Metroid, I will admit, I was one of those guys that made a HUGE "Whaaaaa?!" 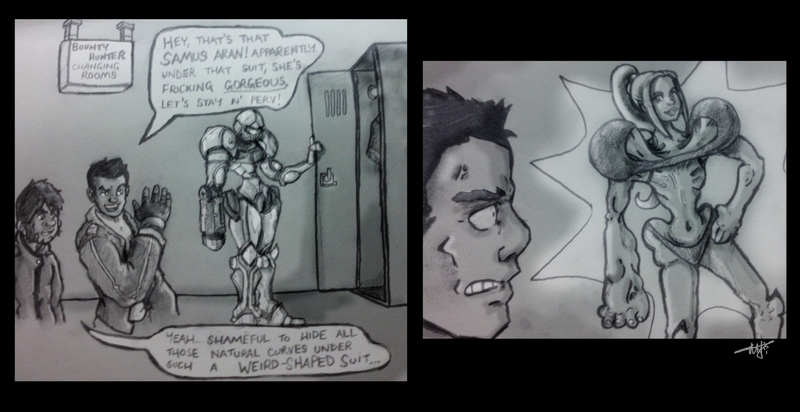 when Samus removed the suit... and was a GIRL! The suit Samus wears is a grotesquely awesome, misshapen silo of pure missile-firing, morphing, super-speed, plasma-grappling AWESOME. It just seemed so... MANLY. BADASS. So for Samus to pop out and be a foxy layday, I guess you could say mind = blown. Ladies can be badass. Girls are cool. But then it got me to thinking... the Varia Suit is such an odd shape, how would one... man OR woman, even fit in there? Oh god... ERASE THOUGHT. ERASE THOUGHT!